BOTTOM PHOTO: Tsé Daa’ Kaan is home to Flowing Water Navajo Casino, which is supposed to funnel some of its revenue back to the chapter after the Navajo Nation Gaming Enterprise pays off its loans. Though Flowing Water has long since been paid off, the enterprise is still paying on Twin Arrows Navajo Casino Resort. Tsé Daa’ Kaan Chapter President James Pioche estimates that any payoff from Flowing Water to the chapter is 10 to 15 years down the road. Long before U.S. 160 barreled through here, long before Farmington was a gleam in anyone's eye, Navajos farmed the fertile flood plains west of what they called the Tsé Daa Kaan, the up-thrust rock. Some of them still do. You can meet them at the Tsé Daa Kaan Senior Citizens Center around lunchtime, because, unfortunately, most of the farmers are seniors now. "A lot of the elderlies are phasing out," sighs Johnny Pete, a fit-looking senior who grows oats and alfalfa on a plot that's been in the family for generations. "The younger generation, they're not really into farming." "Our kids are educated," adds his wife, Sarah. "They're more into their jobs. And the in-laws, forget it. They want nothing to do with farming, but they sure like our corn and squash!" But Tsé Daa' Kaan Chapter President James Pioche isn't ready to give up on farming. "We're the only place on the Navajo Nation that has a steady, year-round supply of water," he argues. "We're the only place that can really make agriculture work." Unfortunately, he says, the chapter is getting no support from Window Rock. In fact, according to Pioche, "The Water Department either ignores us or flat-out stands in our way." To prove his point, Pioche gathers two of his colleagues on the board of Tsé Daa' Kaan Economic Development Inc. -- a nonprofit created to raise money for chapter projects -- and takes the reporter on a tour of Tsé Daa' Kaan's ailing irrigation system. We drive through a dusty wasteland that former Agriculture Department director John Blueyes says used to be some of the best cornfields on the reservation just a few years earlier. As we pull off U.S. 160 onto a lumpy dirt road that parallels the river, it's clear the problem isn't lack of water. The San Juan, swollen by recent monsoons upriver, is a raging brown torrent. We pull up to the diversion, where a portion of the water is funneled into the canal that feeds the farms of Tsé Daa' Kaan. So far so good, at least to layman's eyes the canal is full. But to Pioche, Blueyes and retired chemist Winston Benally, who like Blueyes volunteers his time with TEDI, all is not well. Blueyes points out how wide the canal gets after the diversion point, an indication it is shallower than where it started. Pioche notes the sandbars forming along the canal's south bank. The canal is full of silt. This is bad because silt is the enemy of pumps, and this water has to be pumped up to the fields on the north side of the river high above the riverbank. One of the two pumps charged with this task burned out this year, and Pioche figures that, unless the system is maintained soon, brand-new Pump B will be next. Already, he said, 26 farms went under this year because they couldn't get water. You can hear Pump B busily grinding away, but just a trickle of water is flowing into the pipe that leads from it. The pump is already clogged with silt. Name: This chapter, formerly known as Hogback, is named after the long ridge of rock visible between Hogback, N.M., and Farmington. "Tsé Daa' Kaan" can be roughly translated as "Rock Uplift." Another Navajo name for this area is "Tsé Tahi Kaa," "Rock Eroded by Water," because of the way the river cuts through the Hogback. Geologically, the Tsé Daa' Kaan is part of the Mesa Verde Formation and represents an over-thrust of the North American tectonic plate over the Pacific plate. It is one of a very few examples of what geologists call a "rolling uprising." It forms the boundary between the Navajo Nation and the BLM land west of Farmington and the BLM considers it an Area of Critical Environmental Concern because of two indigenous plants that grow nowhere else in the world. Major clans: Hashtl'ishnii, Ta'neeszahnii, Honágháanii. Famous sons and daughters: Code Talker Tom Jones, former Public Safety director Herb Clah and Eva Benally, who headed Navajo Community College's Shiprock branch. Benally made headlines in 1978 when she and Anita Bradley Pfeiffer were the first females to run for tribal vice chairwoman and chairwoman, respectively. Benally was quoted in the local press as saying tribal chairmanship would be "healthy for the Indian woman." Issues: Alcoholism (the nearest liquor store is 10 miles away, near enough to "ride a bike or hitchhike," according to one resident), neglect of the local irrigation system, bad roads. Assets: proximity to Farmington (25 miles), Shiprock and Cortez, Colo., means access to jobs; San Juan River provides a steady supply of water for agriculture. Of course, silt in the San Juan is not a new problem. But when the BIA used to maintain this system, the men reminisce, it worked just fine. There was a series of sluices to flush silt out the system, and a "ditchwalker" whose entire job was to keep them clean. The men lead the reporter to one of the sluice ditches. If you didn't know it was a ditch, you couldn't tell. It is completely filled in with dirt, upon which has grown a tangle of reeds, grasses and even Russian olive trees. 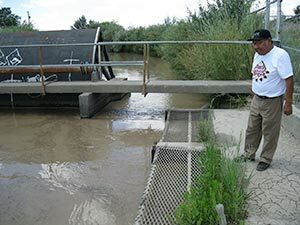 These days, the irrigation systems on the Navajo Nation are supposed to be the responsibility of the Water Management Branch of the Department of Water Resources. Pioche gives the reporter two numbers for the department director, Najam Tariq. There is no answer at either of them, and no answering machine. A call to the department headquarters in Window Rock Tuesday afternoon turns up a recording on an answering machine. A message is left but nobody returns the call. One begins to see what this chapter is up against. To add insult to injury, Tsé Daa' Kaan can't legally do anything about this. "We've offered to maintain the system ourselves," says Pioche, "but they won't even give us the key to the fence around the pump." If they were willing to crawl on their bellies, the chapter officials could get in at a spot where thieves have pried the fence up. Earlier this summer someone snuck in and stole the copper wire leading to the pump. Water Resources made the chapter replace it to the tune of several thousand dollars. If Water Resources would relinquish the system to the chapter, Pioche envisions an army of local teenagers and 20-somethings, whom the chapter could pay out of youth employment funds, attacking the ditches with chainsaws, machetes and shovels. But so far Water Resources has not responded to the offer. Pioche can hardly ever even find someone manning their Shiprock office, he says. The clog in the water system is probably the worst thing this agricultural chapter is facing at the moment, but it's not the only monkey wrench in the machine. Tsé Daa' Kaan was approved for certification back in 2007, but its tax ordinance is sitting on someone's desk at the Department of Justice. "They don't want to approve us because of what happened at Tuba City," explained Pioche, referring to officials from that certified chapter getting caught with their hands in the cookie jar a couple of years ago. Because of this clog in the system, Tsé Daa' Kaan is reaping nothing from busy Flowing Water Navajo Casino a stone's throw from the chapter house. "We just donate to it," joshed Emerson Notah, another regular at the senior center. Like the water in the San Juan, money is flowing at Flowing Water. But Tsé Daa' Kaan can't get its hands on it. Before the host chapters for the casinos get their share of the revenue, the Navajo Nation Gaming Enterprise has to pay off its debts and Twin Arrows Navajo Casino Resort is still figuratively underwater. "When they proposed this casino," says Pioche, who was not chapter president at the time, "I don't think anybody knew we would be supporting a casino on the Arizona side." All the New Mexico casinos, he says, are long since paid off. But good things are happening in Tsé Daa' Kaan in spite of Window Rock. The state of New Mexico, thanks to the efforts of State Rep. Sharon Clahchischilliage -- a Navajo from northern New Mexico -- has been generous in its appropriations for capital projects, and the chapter has plans on the books for a new chapter house (the old one has some scary cracks in its foundation) along with a veterans' center, an extension for the senior center and a greenhouse so farmers can get a head start on the growing season. Pioche checked into Navajo law and found out the tribe could appropriate anything abandoned on tribal land for five years or more, so the chapter is fixing up a huge defunct tractor somebody left on the compound 10 years ago. Long-range plans include a recreational area on the San Juan, with a campground and boat ramp, and Pioche would like to put up some traditional hogans for tourists who want "the real Navajo experience." TEDI is working with the Bureau of Land Management, which owns the actual Tsé Daa' Kaan, on the possibility of a hiking trail up the interesting formation, one of only a handful of examples of "rolling uprising" in the whole world. "It doesn't look bad," said Benally, "but that sucker's steep!" So perhaps the San Juan is a good metaphor for this hardworking chapter. The area is flowing with potential, if Tsé Daa' Kaan can work around the clogs and figure out how to capture it.